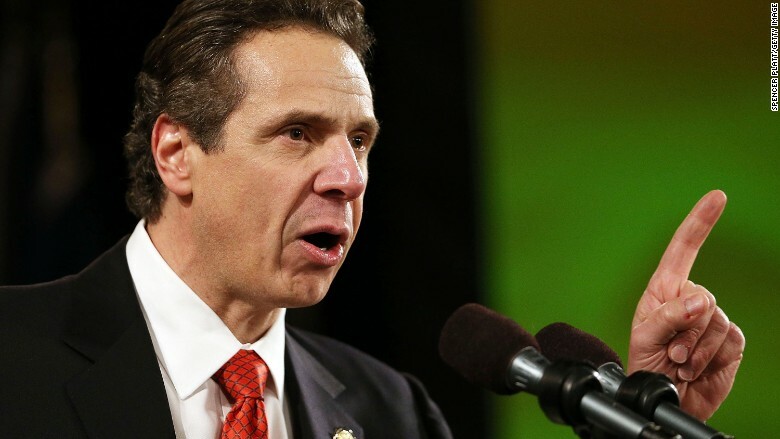 New York Governor Andrew Cuomo wants to give fast-food workers in his state a raise. Cuomo is directing the state labor commissioner to investigate how much employees in the fast-food industry are paid and to determine if it's enough for them to survive. In a New York Times op-ed published Thursday, Cuomo says the labor commissioner will form a panel that will decide in three months if wages in the fast-food industry are "sufficient to provide for the life and health of those workers." If they aren't, Cuomo says he has the power to boost wages without legislative approval. The goal is to address income inequality in the state and set a new standard for minimum wage policy nationwide, according to Cuomo. "Some argue that we can close the income gap by pulling down the top," Cuomo writes in the op-ed. "I believe we should do it by lifting up the bottom." In 2013, Cuomo raised New York's minimum wage to $8.75 from $7.25 per hour. It's set to go up to $9 later this year. The Democrat wanted to lift wages even further this year, but his plan to hike the hourly rate to $10.50 in the state and $11.50 in New York City did not pass the state's divided legislature. The news comes amid a growing push by fast-food workers and those in other low-wage industries to form unions and demand higher pay. Fast-food workers have been holding protests in cities across the nation for more than two years, calling for a minimum wage of $15 an hour. "The governor's move proves that a $15 wage for fast-food and other service workers is no pipe dream," said Christine Owens, executive director of the National Employment Law Project. Cuomo said the gap between worker pay and executive compensation in the fast-food industry is "extreme and obnoxious." The average CEO of a fast-food company earned nearly $24 million in 2013, compared with $16,920 for the average entry-level worker at those companies in New York, according to the op-ed. Cuomo also notes that many fast-food workers rely on public assistance to make ends meet, which he says costs taxpayers in New York $700 million a year. "New York can set fast-food workers on a path out of poverty, ease the burden on taxpayers and create a new national standard," Cuomo wrote.